A memorable encounter with New Zealand’s largest glacier, this journey travels by boat out towards the face of the Tasman Glacier itself. An awe-inspiring journey into one of the country’s most dynamic natural environments, the glacier, towering ice cliffs and icebergs are always on the move, melting, rolling and calving, and reminding visitors that a glacier is not just a piece of ice, but a frozen river. Spectacular views of the surrounding mountains can be had, while the glacially-rich waters are coloured in a magnificent spectrum of blues. An incredible trip for photographers, ice is one of the most various and colourful subjects. 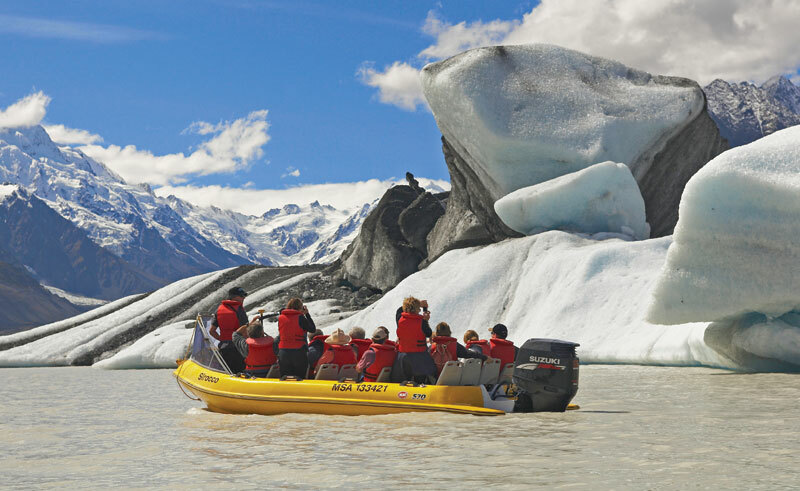 Your engaging guide keeps up a commentary as you travel on the formation of glaciers, icebergs and the impact that this monumental river of ice has had on the landscape of the west coast. Includes transfers- time spent on the lake is approximately 1 hour.